I am on the Library Cat Map! Today I am Proud and Excited to tell you that I have been added to the Library Cat Map! 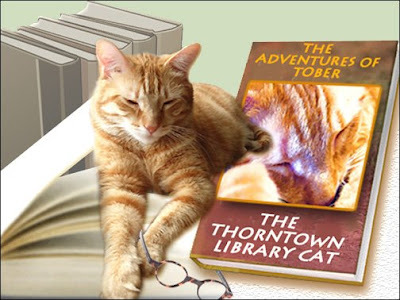 The Library Cat Map is the effort of Gary Roma, who did a video called Puss in Books: Adventures of the Library Cat. This video does not include yours truly, but that is okay, because I was not yet employed (or born) at the time it was filmed. If you know any library cats who are not on the map, encourage them to visit the Library Cat Map and contact Mr. Gary so they can be added. For your viewing pleasure, I am including a picture of me looking Very Tall. This is the picture that is on my new business card. . . I keep meaning to post you pictures of my business cards! My Photographer was very pleased with this picture, especially since she had to crawl around on the floor to get it! She thinks I look like an Explorer sighting land or some silly thing. I put Thorntown on ANOTHER map! Every now and then I go Downstairs to look out the window. I try to do this during the day, when there are very few little children and customers about, because when it is busy my Staff seems to think I should be Upstairs where they can keep an eye on me. I also go Downstairs a lot when my Assistant Boss Karen isn't around, because I can keep a lookout for her from the window. But if you go on the Outside, you can see that I am very near the ground! This makes the Youth Department windows very nice places to watch Birdies! On the day these pictures were taken, I was watching a very plump and juicy-looking robin hopping along looking for stuff. It was very fun--until the Photographer went Outside and scared it away. Speaking of robins. . . my girl-friend Kumari is a mighty Huntress. She brought AB Karen a robin through the pet door last week! I think she really brought it for me, but Karen didn't take the hint and bring it in to work with her. Karen says she's not sure if Kumari caught it herself or just found it and carried it in as a love-offering. I'm pretty sure Kumari did the deed, since she is beautiful, clever, and strong! For those of you who remember Kumari from my earlier posts, I would like to let you know that she seems to be doing very well. She has a great appetite and is gaining weight. She is also playing a lot and getting along well with Karen's other animals and has discovered the Great Outside. I am hoping that she has a long and healthy life ahead of her, and that I will be reporting on her adventures for a very long time! I was thinking. . . do all orange tiger-kitties have dirty-looking spots on the bridge of the nose? I keep myself very, very clean, but I can really only get at the bridge of my nose with my arm. What about you guys? Do any of you have these gray patches? Do these dirty spots lead to baths? I've heard of those, and I don't want one! PS--Check out those fabulous whiskers in the bottom shot! It has been very Busy around here, and I have missed out on a lot of blogging and seeing my blogging friends. Luckily my Photographer had her camera ready a lot, so I have good pictures of me to show you when I get the time to stick them on here. Well, I thought they were for me; she put them right in my sitting spot, after all. You know how I feel about flowers. They should be eaten, played with, and destroyed. These flowers were even more offensive than normal because they came with a giant pink bow. I waited until I was left alone with the flowers, and I pulled off the bow and threw it on the floor. The flowers were tolerable then. Karen thought that the pink offended my masculine tastes. She was right. This pink bow (although I hear it's just a ribbon after my mutilation) now Belongs to Me. Karen keeps it in her desk so I can take my frustrations out on it whenever I want. Yesterday I also engaged in a little fly-hunting, because no amount of treats can really replace the taste of a nice, fresh fly. This is one of the extra services I provide for the Thorntown Public Library, and I think it speaks to my Dedication and Initiative. Below I am putting a picture of Another Cat. This is only because Assistant Assistant Boss Christine begged me to let her post a picture of her girl-cat reading a Library Book. Kitty (yeah, that's her name) lives with AAB Christine and keeps her in line when I am not around to do so. I can't imagine the tortures that this poor cat endures, since her Mommy is one of the ones who upside-downs me all the time. Come to think of it, she looks a bit harassed in this picture, doesn't she? I think I'm All Done for now! I have been given the Life is Grand Award by my lovely friend Poppy Q! She is a beautiful girl-cat who lives in New Zealand with her mum, and she is very accomplished as a taste-tester and cozy-spot-finder. Thanks, Poppy! 1. I get to live (and Boss) in a Library. This is especially Grand, since I was found living Outside with no front fingernails to protect myself. 2. I have lots of people who love me--my Library Staff, my kind and gentle Library customers, and my Cat and human friends who visit my blog all the time. 3. There are many soft chairs in my Library, and I get to try them all! My Assistant Boss Karen even put a special blanket in my favorite chair to make it extra-cozy. 4. 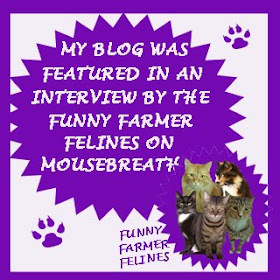 I get to have my Very Own Blog, and I've met lots of great Cats who have lots of fun stories. 5. My life is extra-exciting because of where I live. . . it is all full of people during the day, but at night I get complete reign over the building, which is 14,000 square feets. That's almost as good as living Outside, and I don't have to worry about something Bad getting ahold of me. Reese, a pretty little girl-cat who I recently met. She wears a tuxedo even though she's a girl. How cool is that? One of my earliest Blogging friends, Mr. Tuck. He is a master Contortionist and is working diligently to become a Mancat. BooBoo Black, who has contributed greatly to the feline community by instructing cats around the world How to Control a Big Chair. 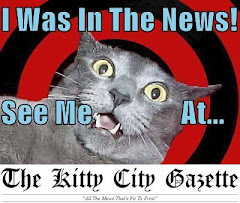 Zippy, Speedy, and Sadie over at Kattonic Cats, who tell wonderfully Funny stories about their humans and each other. They make up a very accomplished Human Bean Training Team. They live in Wisconsin. I wonder if they like cheese? Kirzon, Floyd, Lola, and Virgil (and their human, Amy) at House of Cats. They are some newer Blogging friends who live in the Land of Illinois, and Amy posts lots of nice stories about them. Oh, I like this one a lot! See that green in the right front of the picture? That's 'nip! I'm getting ready for a good roll in it! I am relaxing, because Bossing a Library can be such hard work. Here is a picture of what my AB Karen calls Starfish Paws. I make them a lot. Oh, and now that the Photographer has discovered the super close-up button on her camera, I can't keep her out of my face! I met a real-life Author! The program was Very Big Doings for the Downstairs Staff, and they spent all day putting up displays, setting up the meeting rooms, and preparing packets for the Reading Program. The small people and their mommies and daddies had a Very Good Time during the special program and we are all very glad that Mr. Aylesworth came to visit the Library. I was Not Invited to the special program (I didn't want to steal the show! ), but afterwards, Mr. Aylesworth came upstairs to meet me! But I did not get a picture! Will you take my word for it? 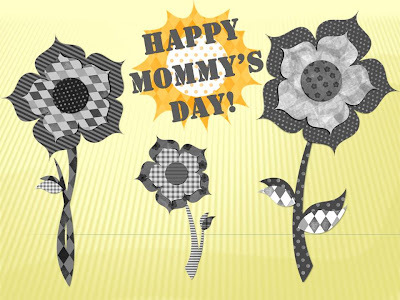 Happy Mommy's Day to all of my Assistant Assistant Boss Mommies. 1. They give me a nice place to live and work. 2. I get lots of very tasty foods. 3. They give me treats, even when I don't do special tricks for them. 4. We have wonderful conversations. . . although most are a bit one-sided. 5. They didn't kick me out of my library, even after I ate lots of Important Cords. 6. They always have places on their desks for me (although sometimes I have to re-arrange things a bit). 7. They give excellent tummy rubs! 8. My litter box is always clean and fresh-smelling, like flowers. 9. They come to me when called. 10. I get great massages. 11. They share their seats. 12. They do not complain when I am shedding--except for when they wear black clothes. 13. They brush me sometimes. 14. I do not like the V-E-T, but they bring me to visit him so that I can stay healthy and live a long time. 15. They give nice chin scritches, which make my whiskers very excited. 16. They let me hide under their desks when someone scary or fast-moving comes in the building. 17. They heat up my supper when it's been in the fridgerator. 18. I am carried to supper every night. 19. They know I love my catnip, so they keep me well-supplied! 20. They love me back! I want to wish a Super-Special Mommy's Day to Assistant Boss Mommy Karen. Thank you for finding me and giving me such a special place to live. I think I'm the luckiest Cat in the world! Happy Mommy's Day to all of the Kitty-Mommies out there. There's nothing like realizing you've found your Forever Home. I was napping in my office a few weeks ago when I was visited by four pretty princesses. They came to the door, but they didn't want to come in (I think Karen was looking extra-busy at the moment), so my Assistant Assistant Boss Christine carried me over to the door so I could meet them. Oh, and they all petted me! At the same time! They are all very good at petting cats, and I think that this was one of the best ways ever to wake up from a nap! I have been waiting and waiting to show you my princesses, but I wanted to get Special Permission from their Mommy. I told her that my blog is read by Very Nice People and Cats, and that my readers would love to see my special visit! I have to show you my special picture made for me by my Zoolatry friends. Thank you, Maggy, Zoey, and Ann! Now I feel like a Very Official Cat Blogger! My name is Tober. OC-Tober. And I like my kibble shaken, not stirred. What do you think? Isn't that some classy stuff? Coming soon. . . I am visited by some pretty little princesses about once a week, and my Assistant Boss got a picture of us! I hear mutterings and murmurings that some of my staff think that I am a grumpy-looking cat. I think my face is very handsome and expressive. Really, I am only pretending to be unhappy here--if the pen had been turned around to the happy side, I would have smiled, too. So you see, I am a very expressive Cat! Every time a new situation arises, I practically transform into a whole new Tober! I do not know what my coworkers are talking about, do you? My Library is front-page material! This week we got the Lebanon Reporter newspaper, and it came with the Boone County Tourism Guide. Guess what! My Library and the giant outside water fountain were on the cover. Helen at the Well stands at the west entrance of the Thorntown Public Library, 124 N. Market St., Thorntown, Boone County, Indiana. The eighteen water spouts of the 12 1/2' steel and aluminum fountain were installed on August 31, 2007, and are activated annually from May through October. More than 334 donors contributed to the project to restore to Thorntown the fountain that graced Main and Market Streets from 1909 to 1944. The new fountain is a replica of the original placed by Anson Mills, engineer and Civil and Indian wars soldier, who was born on a Thorntown farm and in 1909 provided Thorntown a safe (from typhoid fever) water system and four fountains. The largest, the 32-foot Mills Memorial Fountain, was in honor of his parents and included two bowls and a large basin as well as the central figure and three others seated at the base. Residents still recall ice skating in the bowl and meeting their dates and future spouses at the fountain. In 1944 the fountain was removed so that Indiana 47 could become a state highway. The present fountain was reproduced in proportion to the library's entrance and represents the custom of welcoming visitors by the offering of water. So we are all Very Excited that My Library is on the cover of this magazine. I think that the Boone County Tourism folks did a very nice job talking about our special fountain, but does anyone else notice something MISSING from this article? 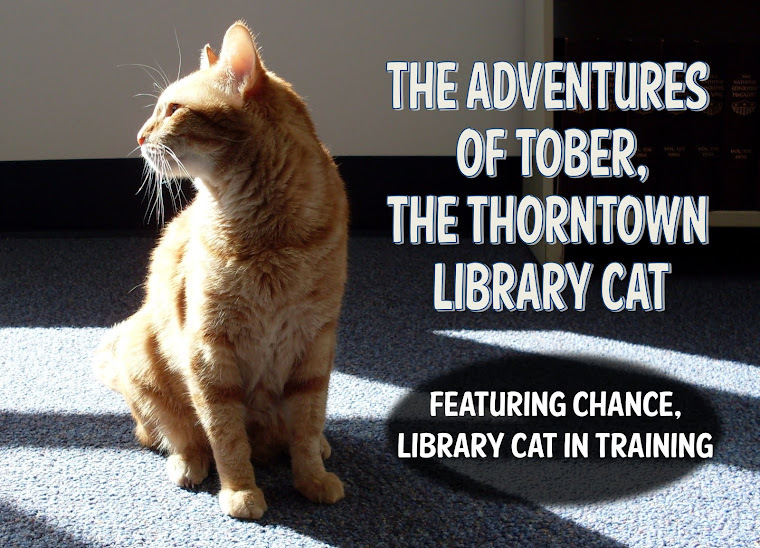 The Thorntown Public Library is also home to (and under the watchful eye of) Tober the Cat, who began his reign in late 2008. Tober is an extremely handsome orange tiger-kitty, and he graciously entertains visitors Monday through Saturday. He loves treats, catnip, and tummy rubs, and if visitors are very, very lucky (and generous with treats) he will often demonstrate how Assistant Boss Karen fetches Apples that he tosses into his wastebasket. I think the next big Thorntown fountain should be called Tober at the Water Dish.